Here at RPS, safety is of paramount importance to us, whether that’s in the office, on the yard, or our drivers out collecting pallets. When it comes to our forklift truck operators, there is no difference. The regulatory body for workplace transport training, RTITB, sets industry leading training standards specifically designed to change behaviour and make measurable improvements to efficiency, risk and safety. The RTITB has trained more than 268,000 delegates to its standards in the UK, Ireland, India and the Middle East over the last two years. 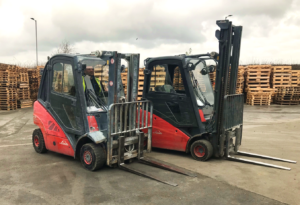 Our site operatives recently renewed their forklift truck licences to RTITB standards, demonstrating our commitment to ensuring that our team is trained to a high standard, for everyone’s safety. Are you looking for a pallet supplier who puts safety first? Get in touch by calling 01642 465556 or tweet us @RPS_Limited.